Snoopy's Holiday. 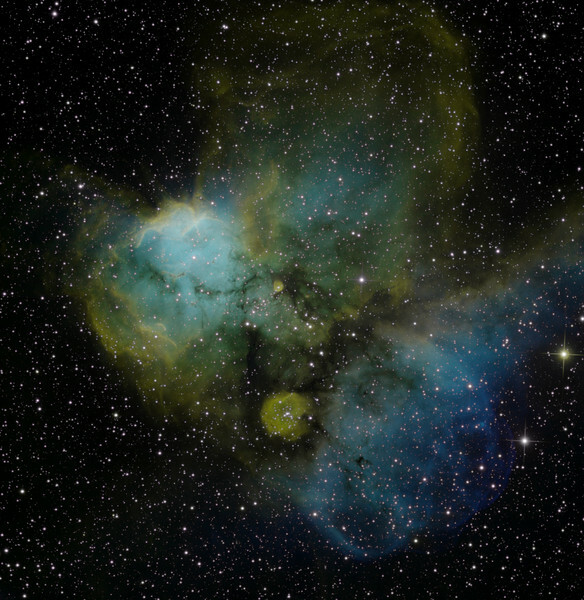 NGC 2467 in Puppis. Snoopy (10 o'clock from centre) is on his rocket ship (nose cone at 10 o'clock, multiple blue ion jet engines at 4 o'clock) heading for the beach. He is wearing a yellow bathing cap. His yellow coat hanger (for his clothes) is immediately below him. His green star-filled beach ball is at 6 o'clock from centre. Sadly, his rocket ship is on fire and emitting multicoloured smoke toward 12 o'clock, and blistering the paint at centre. Wish him well. Hubble palette, Ha OIII SII 21hrs total in 1 hr subs. Aspen 16M on 20 inch PlaneWave.